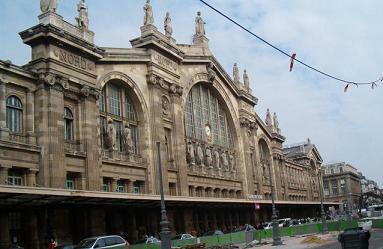 Gare du Nord is the main train station in Paris. From this railway station leave high-speed trains to London, Belgium, France, the Netherlands and Germany. RER train lines B, D and E and metro lines 2, 4, 5 stop at the station. 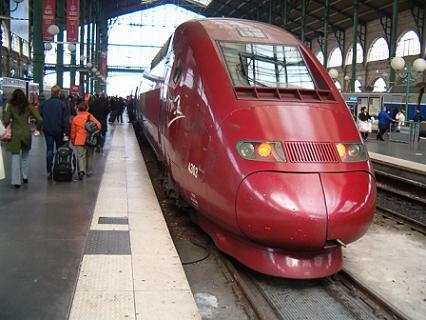 The Thalys is a high-speed train to Belgium, Netherlands and Germany. A cheap ticket from Paris Gare du Nord to Amsterdam is €35. This no-flex ticket is subject to availability and there is no refund when you want to change it. A standard economy ticket is €69. Semi-flex tickets are 50% refundable. Their prices range between €80 for Comfort 2 class till €145 for Comfort 1 class. The Flexible ticket is available in Comfort 1 only and 100% refundable. Eurostar trains are high-speed trains to London, Belgium, Germany, Switzerland and the Alps. The Eurostar trains to the United Kingdom are going through the Channel Tunnel. From London to Paris takes Paris 2 hours and 16 minutes. Charles de Gaulle Airport is the main airport in Paris. It takes 30 minutes by RER train from Gare du Nord. Fare is €10. Trains Grande Vitesse (TGV) are high speed trains to Lille, Calais, Amiens, Lens, Arras, Douai, Valenciennes and Boulogne-sur-Mer. The taxi rank in Gare du Nord is on the ground floor of the station. Metro lines 4 and 5 have a stop at the railway station what makes Gare du Nord the busiest metro station. Follow the ‘M’ sign down the escalator for the metro. Tickets are sold at the ticket windows or ticket vending machine. A single ticket cost €1.80. A carnet is 10 tickets; price is €14.30. Metro line 4 takes you to Les Halles (large shopping center) and Ile de la Cite (Notre Dame, Conciergerie). With metro line 5 you can travel to Boulevard Haussmann with its large department stores.